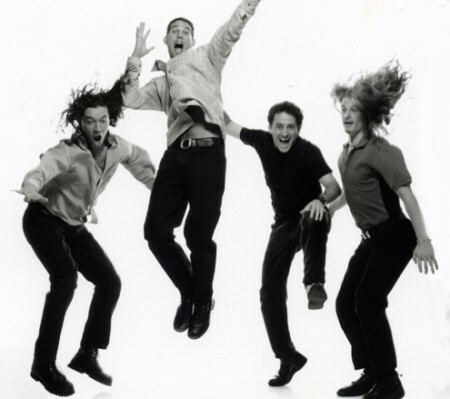 The Chadwicks – Original promo photo circa 1995. The Chadwicks are an Arizona based cover band that has been performing consistently since 1994. They have concentrated on staying current with new songs on the alternative radio stations as well as learning classic rock songs. So, their rock repertoire is as vast as it is diverse. The Chadwicks’ list of clients and events is equally vast and diverse. Their clients over the years have included large corporations such as Wells Fargo and General Mills as well as hundreds of individuals who hired them for a Bar Mitzvah, a Bat Mitzvah, a wedding, a birthday party or just a regular old house party. No audience is too big or too small, having performed in the most intimate clubs and private parties as well as some of the biggest events from coast to coast, including the Democratic Nation Convention in Denver in 2008 and in Charlotte in 2012, Summerfest in Milwaukee (8 times), The Tempe New Years Eve Block Party (3 times), the Waste Management Phoenix Open (Bird’s Nest) and Phoenix Suns and Arizona Diamondbacks games. On numerous occasions, The Chadwicks have shared the stage with nationally recognized artists like 311 (twice), David Lee Roth, Los Lonely Boys, Sugar Ray, and Fuel. The Chadwicks also played every Thursday night at Martini Ranch in Scottsdale for over ten years and many other venues in and around Arizona, like The Joint (Hard Rock Hotel – Las Vegas). They were even sponsored by Miller Genuine Draft and Bud Light in their distinguished history, at separate times of course. The band originated in Tempe, AZ in the fall of 1994 when Drummer, Gary Sanchez, and Bassist, John Colby, decided to put together a band that could play a wide variety of Rock’n’Roll songs. The band’s name comes from the original guitarist, Allan Chadwick, who played with The Chadwicks until 2002. Gary, John, and Tim then recruited their guitarist from Rock Lobster (their eighties band formed in 1995 as a side project). Dallan Baumgarten had been flying in from Los Angeles every Saturday to play in Rock Lobster for about two years, as well as playing in an original band in LA (Big Love) and touring with the band, Berlin. It was a natural fit and The Chadwicks haven’t missed a beat.